Year 1968… The tribune of Middle East Technical University (METU) Stadium woke up to a new morning with a word, which was printed on concrete seats from one end to another: “Revolution”. Year 2008, a mayor came up with a bewildering idea about tearing down METU campus. This time Students of METU striked him back “if he ever intends, we rewrite ‘Revolution’ on the tribunes once again.” and as a matter of fact they did. 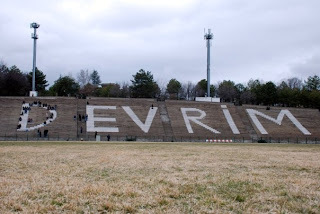 The students of METU rewrote “revolution” once again to tribunes of METU Stadium, which has already been named as METU Revolution Stadium, with more prominent letters this time, 40 years after. Now and then, the Sculpture called "Science tree", the icon of the campus, continues growing despite of the people who would prefer the other way around. And it is obvious now that the ones, who were talking about demolishing, could not even touch a wall in the campus. One more year passes and the date shows 2009 now. The government of Bush which had the world leaned on "Intelligent Design" becomes a history and one of the first actions of the new President Barack Obama is to lift federal bans on embryonic stem cell research. However, our government decides to clone New Bush babies, while they do show superficial support to the new government. The censorship in Turkey is expanding in every way of communication including internet, television, radio, magazines, and newspapers. The censorship, which often “touches” the rights of media chose the scientific magazine “Bilim ve Teknik” (Science and Technology) published by TÜBİTAK (The Scientific and Technological Research Council of Turkey- for the funding of research and science management) this time to apply its own rights: Cover of the magazine with the theme of “Darwin’s 200th birthday” and 15-page-news about “evolution theory” were removed instantly before published. Furthermore, production director of the magazine is relieved of duty and a big “change” in the management personnel is initiated. It is obvious that the effect of Harun Yahya is showing itself even in TÜBİTAK. Then, where do we remember this name? Absolutely from the websites, which he caused, to be censored in Turkey because of his “opposing thoughts to evolution”and from his own“weird presses, which are distributed all around the world without any payment or permission. While leading press and writers protest these acts on the media, they are shown as an open target by Harun Yahya and the same-minded people and accused of being advocates of inferior generation. Today media and especially science is tried to be reshaped systematically, and unfortunately, the outstanding word "freedom" stands right in front of us naked and weaker than ever. We are METU. Every single person in METU knows to say “En’el METU” (I am METU) when needed. As seen in the history, sovereigns always change in time; however, the Science Tree located in METU keeps nourishing the humanity. We want to emphasize our actual protest: Since we are supporting the right for unconstrained expression, we cannot accept either the censorship or the dictated command.